In the end, it was once again the story of the naked emperor who strutted about all over his kingdom, but who had no one to tell him that he had no clothes on. Except that in today’s story, the emperor turns out to be an empress. 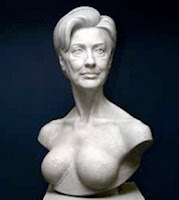 Hillary Clinton was romping the American stage for a year, exposing her weaknesses for all to see: her overarching artificiality, her attempt at cleverness, her desperate ambition, her constant prevarication, her unethical deeds, they were all nakedly in sight for a full year. Even the solitary fig leaf of so-called ‘work experience’ began to slip off during the long exposure to media lights: it could be seen that she had risen to her full level of incompetence. But that is for those who wanted to see. Unlike the naked emperor’s story where his staff did not speak out of fear, and the populace did not speak out of respect, the two categories of people here who refused to see or speak were the establishment elite, and the feminists. The establishment is of course a reference to the entrenched elite who have their hands in the till – the politicians, the bankers, the lobbyists, the media – who profit from one of their own winning the election, and who are very nervous of anything or anyone disturbing the status quo. They saw the naked empress, but refused to speak. The feminist group, on the other hand, refused to see. These were the older feminists, more my contemporaries, who are so emotionally attached to the gender issue that it side-blinded their moral and rational acumen. To them it was as if the empress was wearing a bright jewel of feminism, and the dazzle of that jewel blinded them from noticing that she was wearing little else. But as I said, this was the case only with the older feminists: the urban, educated, left-leaning, independent ones. Because the election results show that a lot of the younger women and also the older, non-college, non-urban women, could see clearly the naked empress, and have announced so to the world through their ballot. Poor Hillary. If only she had friends who could tell her the truth, and not let her get delusional about her talents or her chances of winning. Interestingly, the person she was challenging was one who constantly directed attention to his own nakedness, maybe that is because such is his personality. For this, he was derided by both friend and foe. So lucky Donald. He had more people than he wanted telling him precisely what he was. Even though his ideas may sound delusional to many of us, he himself had a fair measure of what he could achieve. For feminists seeking a symbolic victory, this is a double blow. Not only is a woman not the winner, but the man who won has been openly labeled an enemy of women, and further, he took 53 per cent of white women’s votes (to Hillary’s 43 per cent). But most of all, what the feminists will regret is that they have also lost all their other progressive ideals – about minimum wage, about the environment, about racial integration; all that too has been sacrificed for the greed of having a mere symbol, that too a very faulty and degenerate symbol. If not for this desperate greed for a symbol, they may have had today in the White House a strong, progressive, feminist, human being in the form of Bernie Sanders. Maybe the older feminists, many among them my good friends, need to take a relook at this divisive binary of woman as an opposite of man, as opposed to man, as a category exclusive of man. It is dehumanizing, in a way. Maybe we could learn something from the younger millennial women, and the non-college women, who think, and vote, differently.